You know those cookbooks that, when you pick them up, you a great feeling immediately? An I-can-do-this-wow-I-wish-I'd-had-this-book-years-ago feeling? That's exactly what I felt when I opened up Great Gluten-Free Vegan Eats , by Allyson Kramer. This book is seriously awesome. 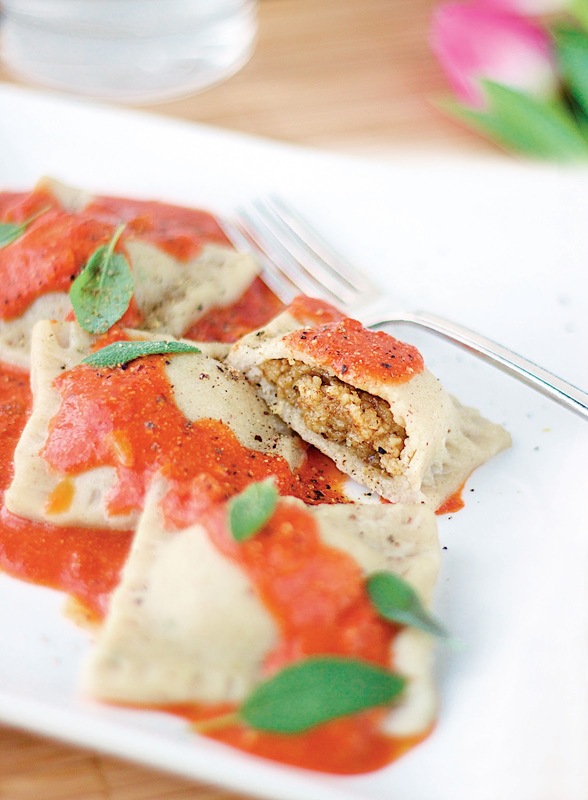 It has all the foods you've probably been missing since becoming a gluten-free vegan. I've made my own pasta, pizza, and chocolate chip cookies that all tasted like the "real thing". In fact, for an entire week I cooked only recipes that were found in this cookbook, and I'd say that D and I had an awfully well-fed and delicious week. I can't say enough good things about this book, so I think I'll let it talk for itself now. Here's a great recipe for you to try to convince you you need this book on your shelf. I'm so excited to share the fantastic ravioli recipe with you, and, even better - I get to send a lucky reader a copy of the book (American readers only, please). There's more information after the delicious recipe and pictures! Enjoy! Tender pillows of dough are stuffed with a meaty walnut filling and topped with a decadent vodka sauce. This meal is very hearty and takes a bit of prep work, so it’s best reserved for a special occasion or an at-home date night. Sift together the superfine brown rice flour, xanthan gum, and sea salt in a large bowl. Using a fork, stir in the water a little bit at a time to form a soft dough. Turn out onto a lightly (brown rice) floured surface and knead about 2-3 T. flour into the dough until it is no longer sticky. Add just enough to make a slightly elastic dough. Divide the dough in half. Pat each section with a touch more superfine brown rice flour on each side. Turn one section out onto a lightly floured countertop. Using a lightly floured rolling pin, roll one section of dough into an 8x16" rectangle until the dough is about 1/8" thick. 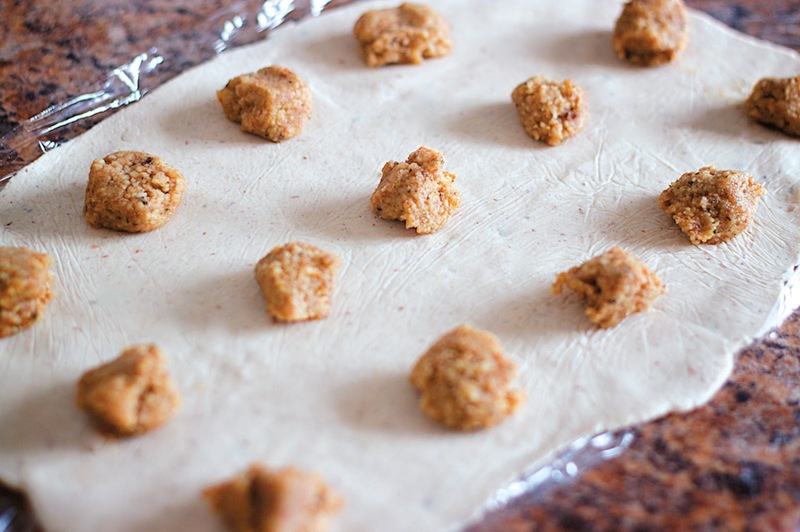 If the dough sticks to your rolling surface, add a touch more flour. Divide the dough in half and chill in the refrigerator while you prepare the filling. Combine the garlic, walnuts, thyme, sage, salt, and flaxseed in a food processor. Pulse until crumbly. Slowly drizzle in 1 tablespoon (15 ml) of the olive oil at a time and pulse to blend. Heat the olive oil in a large skillet and sauté the garlic and onion over medium heat until golden brown. Reduce the heat to low and continue to cook until the onions are translucent. Stir in the tomatoes and juice, vodka, vinegar, sugar, basil, and yeast. Simmer for about 20 minutes or until you can no longer taste the vodka, stirring often. Remove from the heat and stir in the coconut milk. Set aside. Roll out each section of pasta dough between 2 pieces of plastic wrap. You are aiming to make two 12 × 16-inch (30.5 × 40.5 cm) rectangles that are about 1-1/8-inch (3 mm)-thick. In the meantime, bring a large pot of salted water to a boil. 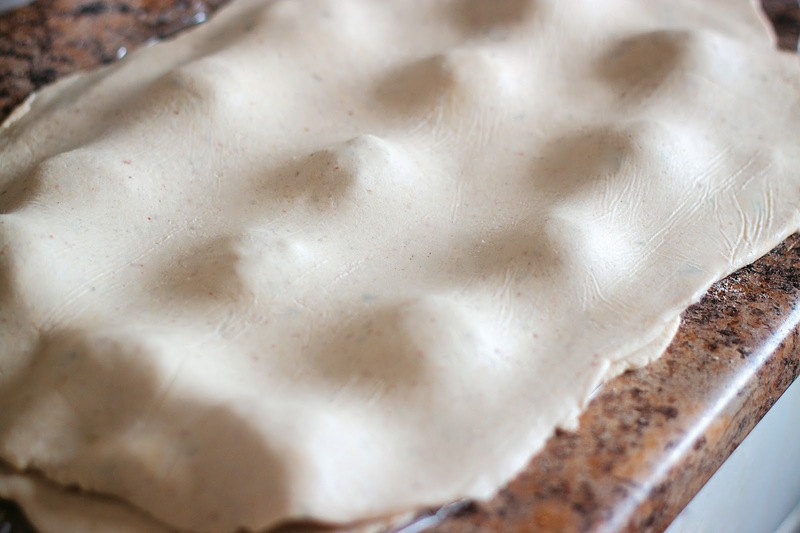 Place about 2 teaspoons of filling evenly onto the dough, leaving a 1-inch (2.5 cm) radius around the filling mounds. You should have around 15 mounds evenly spaced on one layer of dough. Gently cover with the second piece of rolled-out dough. 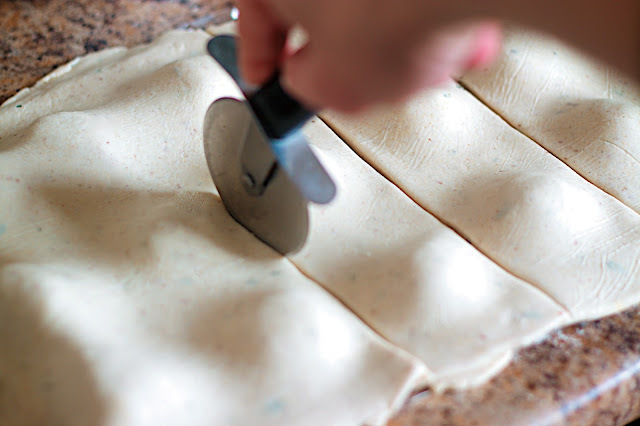 I use the plastic wrap to help flip one layer of dough evenly on top of the filling mounds. Use a pizza cutter or ravioli wheel to cut out individual ravioli. 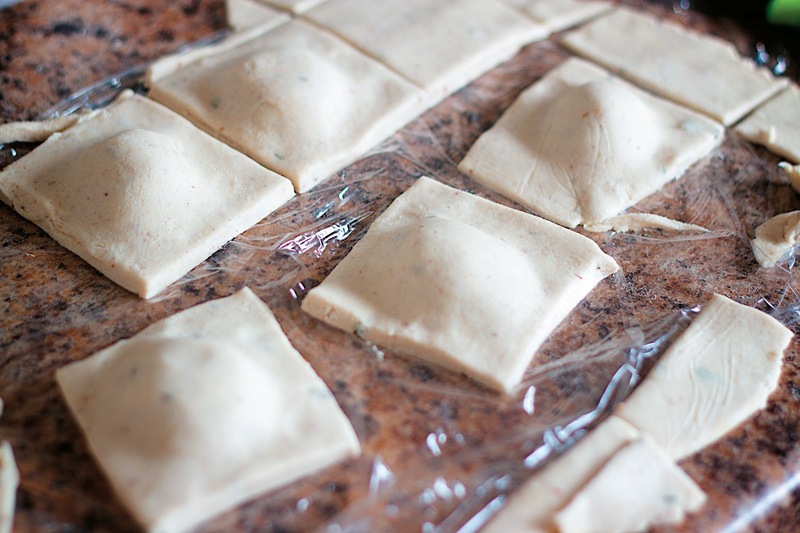 Seal the outside of the dough with a little water and crimp the edges with a fork so that the ravioli are watertight. Boil a few ravioli at a time for exactly 2 minutes. Strain out with a slotted spoon and place in a bowl. Then add the cooked ravioli to the sauce and simmer for about 5 minutes. Serve hot. Now, it's your turn to enjoy treats out of the book yourself! Simply enter the giveaway below for your chance to win a copy of this fabulous book. Good luck! chickpea burgers are my favorite...cheers! Those ravioli look so good! Theyve been on my list to attempt for sometime now.